Delightful little bowl with border pattern around the outside and inside rim and scenic pattern inside to the base. No backstamp. Light crazing with a very small manufacturing blemish inside and a little wear underneath to the foot rim. A very pretty dish with fluted wavy rim and pattern on the inside only. No backstamp. Some wear and discolouration to the rim otherwise excellent condition. Very pretty dish with side handle printed in a steely blue. Backstamp: Adams Est 1657 Cattle Scenery England. There is some brown mottling, mainly underneath and to the rim, and a tiny discreet hairline to the rim. 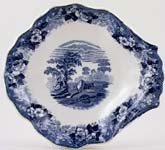 Delightful bowl with fluted wavy rim and lovely rural scene to the centre surrounded by a wide floral border, printed in a steely blue. No backstamp. Crazed with just a little minor discolouration. Small square bowl with indented corners. Fabulous rural scene to the cetnre surrounded by lovely floral border, with four "cattle" vignettes around the outside. Backstamp: Adams W A & Co Est 1657 Cattle Scenery Ironstone. Crazed with a couple of tiny glazing blemishes to the outside otherwise excellent condition. Lovely square bowl with indented corners, beautifully patterned both inside and out. Backstamp: Adams Est 1657 W A & Co Cattle Scenery Ironstone. The occasional bubble in the glaze, a little minor surface scratching inside and a little blue smudging here and there otherwise excellent condition. 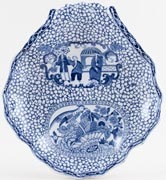 Small bowl with gorgeous floral decoration around the outside and rural scene inside to the centre. No backstamp. Some surface scratching inside and the stilt marks are quite evident otherwise excellent condition. Delightful oval dish with fluted rim. Backstamp: Adams Est 1657 W A & Co Cattle Scenery Ironstone. An adorable small bowl. It has a little surface scratching inside to the base otherwise in excellent condition. Lovely bowl, square with indented corners. Beautifully patterned both inside and out. A little crazing with a little associated minor staining underneath otherwise absolutely fine, with none of the surface scratching so usually seen inside bowls. 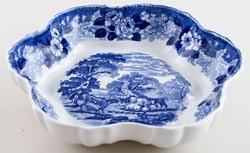 Absolutely delightful bowl with fluted wavy rim and lovely rural scene to the centre surrounded by a wide floral border. Backstamp: Adams Cattle Scenery England. A little minor wear to the rim and a couple of tiny blemishes inside to the base, overall excellent condition. Gorgeous bowl with a moulded fluted rim giving the appearance of a flower. Backstamp: Adams Est 1657 Cattle Scenery England. It is crazed otherwise in excellent condition. Lovely round bowl with border pattern and rural scene inside and wide border pattern to the outside. Backstamp: Adams Est 1657 WA & C Cattle Scenery Ironstone. Lovely round bowl. 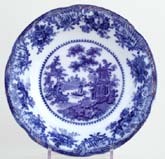 Wide border pattern around the outside, and narrow border pattern around the inside rim with rural scene to the base. Backstamp: Blue printed Adams W A & Co Cattle Scenery Ironstone. There is surface scratching inside to the base and also inside the pattern is streaky otherwise fine. This is a really lovely bowl. Wide border pattern around the outside, with border pattern around the inside rim and sides and lovely rural scene inside to the base. Blue printed Adams Cattle Scenery Ironstone England and impressed Adams Tunstall. Delightful wide floral border around the outside of the bowl, with a rural scene inside and floral border around the rim. This is the largest fruit or serving bowl we have seen in Cattle Scenery. It is deep as well as wide. Printed in the dark blue version of this design and decorated inside and out. Usual blue printed Adams Cattle Scenery backstamp in use from 1896 to 1917. Delightful small oval dish. Backstamp: Rd No. 623294 This Pattern was introduced by William Adams in 1780 being a copy of a Chinese pattern & one of the first of its style produced in English Pottery Wm Adams. Light all over crazing with a little wear and discolouration to the outer rim and underneath the dish. There is thin glaze around the rim which makes the blue appear a little green/grey. Small bowl beautifully decorated both inside and out. Light crazing and there is a small "dent" on the rim which occurred during manufacture and has been glazed over. Lovely round bowl with white gadrooned rim. Pattern on the inside only. Backstamp: Rd No. 623294. This pattern was introduced by William Adams ..... Wm Adams. A little minor wear to the outer rim and underneatha few minor manufacturing blemishes otherwise excellent condition. Lovely little bowl, square with indented corners. Superb condition. Delightful little dish with side handles and pattern on the inside only. Backstamp: Rd No 623294 This Pattern was introduced by William Adams in 1780 being a copy of a Chinese pattern & one of the first of its style produced in English pottery Wm Adams. Light crazing otherwise excellent condition. A delightful small bowl beautifully decorated both inside and out. It has a little surface scratching inside otherwise excellent condition. This is a gorgeous little shallow bowl. It is in excellent condition. Pretty small bowl with full pattern around the outside and just narrow border pattern inside. Usual blue printed backstamp including reg. no. 623294 for 1913. Lovely bowl beautifully patterned both inside and out. 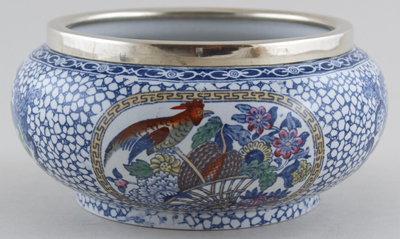 Slightly different to the usual Chinese Bird bowl as it stands on a small foot. Backstamp: Rd no. 623294. This pattern was introduced by William Adams ..... Wm Adams England and impressed Adams Tunstall. Inside there is a little surface scratching to the base and the stilt marks have absorbed a little stain otherwise excellent condition. A very attractive dish from a dessert service with fluted side handle. Backstamp: Rd No 623294 This Pattern was introduced by William Adams in 1780 being a copy of a Chinese pattern & one of the first of its style produced in English Pottery Wm Adams England. A little minor wear to the rim and underneath a little brown mottling, overall excellent condition. Lovely large bowl with gently flared rim. Excellent condition. Lovely shallow bowl with fluted wavy rim. Backstamp: Rd no. 623294. This pattern was introduced by William Adams ..... Wm Adams. Light crazing otherwise excellent condition. Fabulous bowl beautifully decorated both inside and out. Backstamp: Rd No. 623294 This Pattern was introduced by William Adams in 1780 being a copy of a Chinese pattern & one of the first of its style produced in English Pottery Wm Adams England. Excellent condition. 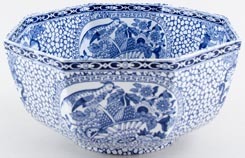 A magnificent large round bowl, beautifully patterned both inside and out. It has light all over crazing and there is a little very minor wear to the rim and just a little pooling of the glaze inside the bowl to the base otherwise absolutely fine. A very pretty dish in an unusual shape - basically square with wavy moulded rim and cut corners! There is a little wear to the rim otherwise excellent condition. The famous 1916 re-introduction of an Adams classic design. This is a beautiful shape bowl. It has a little light crazing otherwise excellent condition. Blue printed backstamp with Rd No 623294 Wm Adams England. Fabulous large bowl, beautifully decorated both inside and out. Backstamp: Reg. No. 623294 This pattern was introduced by William Adams in 1780 being a copy of a Chinese pattern and one of the first of its style produced in English pottery. Wm Adams England and impressed Adams Tunstall. A little very minor surface scratching inside to the base, overall excellent condition. Fabulous large octagonal bowl, beautifully patterned both inside and out with four pattern cartouches inside and four around the outside. Backstamp: Rd No 623294 This pattern was introduced by William Adams in 1780 being a copy of a Chinese pattern and one of the first of its style produced in English pottery. Wm Adams England. Light crazing otherwise excellent condition. Lovely round bowl beautifully decorated both inside and out. Backstamp: Rd no. 623294. This pattern was introduced by William Adams ..... Wm Adams England. A little minor wear to the rim otherwise excellent condition. Delightful small bowl with indented corners. One tiny area of thin glaze on rim, otherwise superb. Lovely octagonal bowl beautifully decorated both inside and out. Excellent condition. This large octagonal bowl is really impressive. Four pattern cartouches around the outside and four inside. It has all over crazing with just a little associated discolouration mainly inside to the base, otherwise fine. Backstamp: Rd No 623294 This pattern was introduced by William Adams in 1780 being a copy of a Chinese pattern & one of the first of its style produced in English pottery. Wm Adams. Very pretty bowl with a little gilt spatter decoration around the rim. Pattern on the inside only. Excellent condition. Not marked but almost certainly Adams.